I love this state of mind, but I have to be careful. When an idea strikes, I may abruptly stop what I am doing and spend hours pondering, writing up, sketching, and researching "creative alternatives" that I just don't have time for. Before I know it, I've wandered far astray from any plan or schedule I had for the day. The problem isn't whether these these ideas are realistic or worthwhile. Sometimes they are, sometimes they aren't. Either way, I perceive value in the exercise of thinking about them. The problem is priorities. It is hard to tear myself away from my latest inspiration even when I know there are vastly more important things to do. This post has two parts, one about math and one about explaining. Part 1: commentary on the following animation. This illustrates pretty much everything I remember about trigonometry. Pick a point on the unit circle. The x coordinate of that point is the cosine of the angle, and the y coordinate is the sine. It's as simple as that: cosine is the horizontal leg, sine is the vertical leg. For any point on the circle. Granted, not all trig formulas are so easy to reconstruct off the cuff. One other thing: angles in trig are measured in radians, which is the length of the arc that is swept out on that circle. Since the circumference of any circle is 2πr, the circumference of the unit circle is 2π*1, which is 2π. So for example by drawing the picture you can remember that sin(90°) = sin (π/2) = 1 (it's the point at the very top of the circle, with x = 0, y = 1). Part 2: tangential thoughts (so to speak). I swear, this is the kind of thing where I could spend hours and hours making a 5-minute explanatory slide presentation and video. Don't ask for anything more advanced math-wise; this is all I know about trig. And I'm positive you can already find this exact explanation for free at Khan Academy or Quora or Stack Exchange or a million other places. See also Vi Hart, whose videos remind me that it's not all about bells and whistles, and that clear, insightful explanation with clever use of low-tech is extremely compelling. But still, if the planets that govern my whims and impulses were to align, I'd totally do my own take on the unit-circle explanation. At least I think I would. In my dream scenario, I'd fuss over language and graphics and pacing. I'd like some way for people to easily jump around and either skip or re-watch some portions. I know some people learn better when they hear, so voiceover would have to be part of it. I guess that means subtitles too, and if I feel really ambitious, translations to multiple languages. Along the way, my math-y friends would say, "You know, there's a MUCH easier way to make that animation in seconds rather than hours, using Mathematica or whatnot" (or a Swift playground — ooh! ), and my brain would hurt a lot learning the whatnot, and the brain pain would make me regret my initial eager impulse to share. But hopefully I'd muddle through. During "user testing" (as we software people call it) I'd learn about areas that people commonly have trouble understanding, and I'd reframe the presentation to address those areas. It's crazy to want to spend all that time on something people can already get elsewhere. And truth be told, talk is cheap, and I wouldn't be quite as ambitious as I claim. But I do love that I know this one cool thing, and although I often misjudge my own ability to communicate, maybe I can help you know it too. If not you, maybe your kid. Or if you are a kid, maybe your parents. Whether you're a "math person" or not, if you understand the above animation then you understand the single most important thing about the scary subject of trigonometry. There are a few isolated nuggets of knowledge like this, not all about math, that I get the itch to explain. Some, I'm pretty confident about. In other cases, the idea would be to explain what I think I know, and I'd be looking for feedback and corrections. Maybe I'll take up "explaining" as a hobby. Maybe I'll make "explanations" the way amateur carpenters build cabinets. And just as a carpenter tries to make a better cabinet each time, maybe I'll take multiple passes at explaining the same thing if I feel the need. By the way, I'd love to be an amateur carpenter too, and make actual physical stuff, but who has time for that? I've been bugging friends in various forums about what I've been finding out about weight loss. One thing I am sure of: there is a huge amount to question, challenge, and reconsider when it comes to what we know about obesity and nutrition. We have so much to learn, and so much to unlearn, having discovered that what we already learned was bogus. Doing good studies on human subjects is very expensive, but so are the costs of health care for metabolic conditions. And confounding it all are people jockeying for political advantage of some kind, or looking to make a buck. There's always a buck to made in areas that are both deeply important to people and highly confusing. I frequently feel overwhelmed, and I struggle with my intellectual limitations. For one thing, I want to get things right, but my biases are strong. And when I try to read about certain topics — recent ones are statistics and chemistry — the part of me that is "nerd" completely fails me. My eyes glaze over, and my brain folds its arms and says "You should have studied this stuff when I told you to 35 years ago." For now I will keep trying to understand, and will keep spouting off and asking for correction and feedback. My attention span swings like a yoyo, but so far it seems to keep swinging back to this topic. The NY Times article about the Biggest Loser contestants has been showing up in various places I follow. I've only skimmed it, but my preliminary reaction is "I'm surprised anyone's surprised." Which I know sounds dismissive, and I know it's annoying when people say that. But time and time again it's been shown that starvation diets don't work long-term. It's old news that your metabolism slows down when you starve yourself. That's partly why simple calorie restriction doesn't work. That approach might be fine if calories-in and calories-out were independent variables, but they are not: reducing the former affects the latter. If you simply starve yourself using blind calorie counting, your body will change its energy budget, and now you're chasing a moving target, on top of which you feel crappy. Another fallacy in "calories in, calories out" is that most people take that to mean calories in and out of the body as a whole. But what we care about is calories in and out of our FAT CELLS specifically, and that simple change in perspective leads to useful ways of reasoning. We KNOW that WHAT you eat — as in protein vs. fat vs. carbohydrate — has a large effect on how your body meets its energy budget, in particular, how much energy it gets by burning fat. We KNOW that carbohydrates bump insulin, and insulin is the primary driver that tells fat cells to get fatter and more numerous. None of this comes from some recent magic discovery. It's old, boring, first-year-med-school news . But I can't tell from the article how much of this knowledge was applied to the Biggest Loser contestants. By the way, it also seems there is a lot of variation among individuals in how they respond to a given intervention, which to its credit the article does mention. The findings about levels of leptin and other satiety hormones are interesting. My current understanding is that we still have a lot to learn about the hunger and satiety hormones, but they're a promising avenue of research. My understanding is that fat cells secrete leptin, which means it should be no surprise that huge decreases in fat caused the subjects' leptin levels to drop precipitously. I've seen a claim  that insulin blocks leptin from getting its message to the brain. But I hesitate to make any strong claims about hunger and satiety hormones — the research is much more recent than what we know about insulin. My impression is that the Biggest Loser show took an approach to weight loss that has been proven to fail, and dialed it up to 11 for entertainment value. That's my impression, but I'm open to learning that I'm wrong. And if useful science can result regardless of that, then at least that's a good thing. At least that's what I've read. I'd be curious if any of you who are doctors or know doctors can confirm. One of the books I have shows a chart from a med school textbook that supposedly supports the "first-year med school" claim. I'll try to find it. But whether or not it's strictly true that any rookie med student "knows" this about insulin, I'm pretty sure it's long-established fact. My caveat on this video is that Lustig has been criticized for his claims about fructose. I'm not sure yet how to evaluate the criticisms. But what he says about insulin jibes with everything I've read. Again, I'm open to learning that I'm wrong. You guys are killing me over here. So much fascinating stuff today, so many articles I want to read and respond to, so many interesting updates about your lives, so much plain old fun. I open my Facebook timeline and my brain is like a dog bombarded with a million amazing, irresistible scents. That dog is going to starve to death if it doesn't pick a rabbit to chase. On top of that, my mental bandwidth is so narrow. It feels like dial-up Internet when what I need is fiber-optic. It's like in a spy movie when the spy is stealing computer files, and the bad guys are beating down the door, and you're watching the download progress bar, thinking "Argh, HURRY UP AND COPY FASTER so the spy can escape!" I feel like that during a high percentage of my waking hours. My progress bar always feels like it's moving too slow relative to the urgency of my impulses around information. My "bandwidth" is frustratingly low in both directions. In the incoming direction — I'm not a great reader. 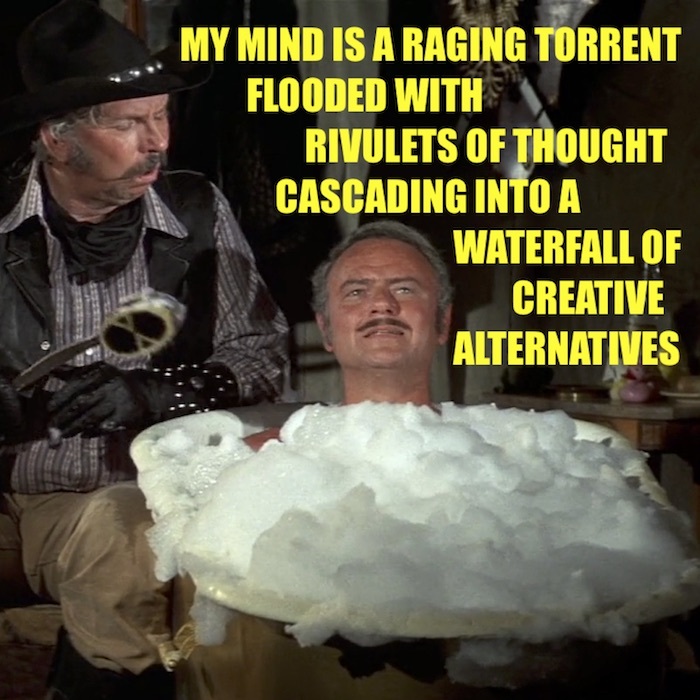 I have to reread a lot, and it takes me more effort than your average bear to put together a mental model of what the heck the writer is saying. Maybe I should work to improve on this, to learn to read. That said, on rare occasions when that mental model interests me, I will turn it over and over in my head long past where most people would have been tired of it. I fiddle with it, critique it, boil it down. I try to think how I would communicate it to someone else. For better or worse, I am glad I do that. I value my fussiness — I think it means I care about getting things right — though I wish I could direct it more selectively and productively. In the outgoing direction — I often struggle to express myself in words. Takes me way too long to compose simple email replies. Yes, writing is partly an act of discovery, and a certain amount of writerly squirming is necessary to figure out what I think. But sometimes, honestly, just spit it out already. No one is going to judge, remember, or necessarily even notice this thing I'm writing. And if they do judge, well hey, it's a free American country , I can say what I want. This is also something for me to work on, the spitting it out already. There's a flip side, which is that I can babble at length once I do get going, which is not great in terms of having good conversations. It's both a social skill thing and a cognitive thing, I think. All I really meant to say is, I'm trying to rush through my Facebook-skimming today — a few quick likes and shares, and then step away, and get back to various tasks I'm behind on. But you guys make that difficult.